”] My Petal Model of Social Engagement seemed to go down well at TechHub yesterday when we applied it to social startup design. Whether the startup was a food social network, a new film about the monarchy or a train booking application, the group found examples of active viral loops, passive viral loops, positive and negative daily loop to apply to their products. Indeed, one of the participants was a full time social game designer and the session prompted him to fix a negative daily loop on his application today! 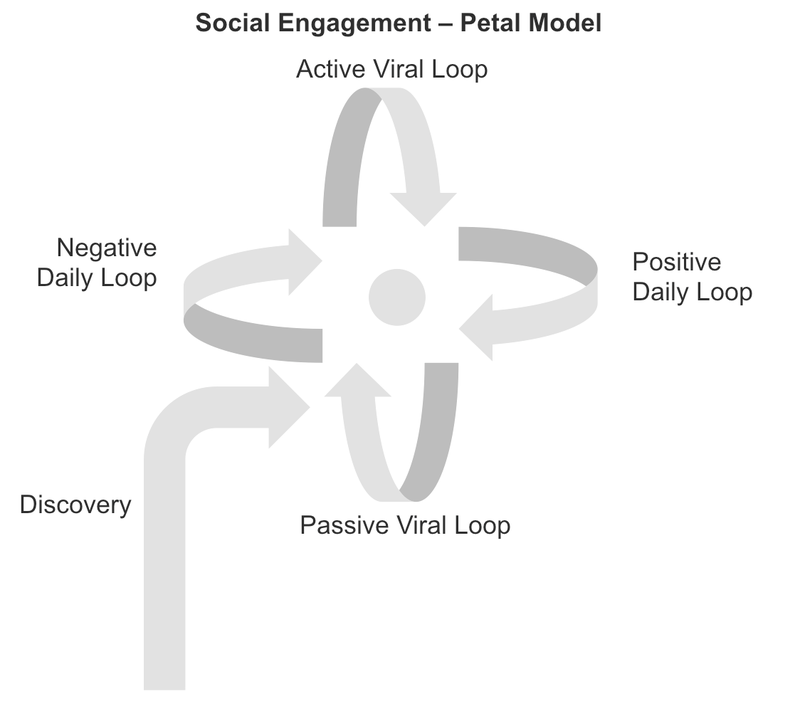 A key question that came up, which is worth discussing here in the blog, is what percentage of acquistions are likely to come from the viral engagement channels (the viral petals in our model) versus from the initial discovery (the stem). This relates to the virality of the app, as measured by the viral coefficient (the number of earned users you get relative to each paid user). Obviously benchmarks vary wildly depending on the application type but I would say that if you see 30% uplift (a viral coefficient of 0.3) on your initial discovery then you are doing well. For a product to ‘go viral’ – i.e. to spread of its own accord you would need to see a viral uplift of at least 100% – for each person you add they bring in at least one more. I want to introduce a new model for planning social engagement around your application or page. 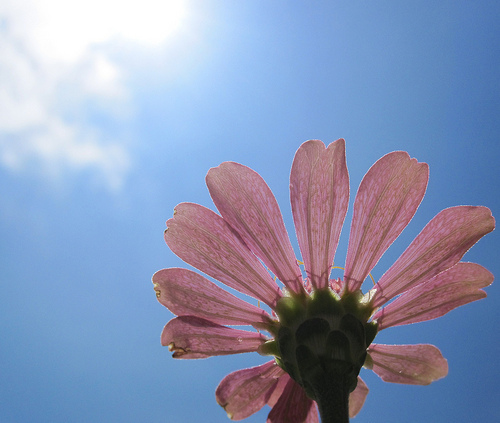 I’m calling it the Petal Model as it has four ‘petals’ that you need to think about when designing for social. The diagram above shows the model, now here’s the explanation! Active Viral Loop – this is how users will get their friends to engage. It’s active because it requires the user to do something additional to entice their friends in – it might be publishing a post on their wall or inviting a friend to join in a game. Passive Viral Loop – this is how friends discover the application indirectly – for example seeing a friend in the leaderboard, seeing that a user has invited a mutual friend and clicking in to see what the fuss is about. Positive Daily Loop – this is a reward a user can get each day they return to the application. Typically this might be a daily virtual coin bonus or in an online farm this might be some crops that can be harvested. Negative Daily Loop – this is the penalty for what happens if you don’t return. In our online farm this might be that the crops die, the farmyard overgrows with weeds and so on. By considering all four types of loops in a social application you will be well on your way to ensuring you are maximising your social engagement and the spread of your application. Don’t forget that just as a flower can have many petals, there is no limit to the number of petals you have in your application.